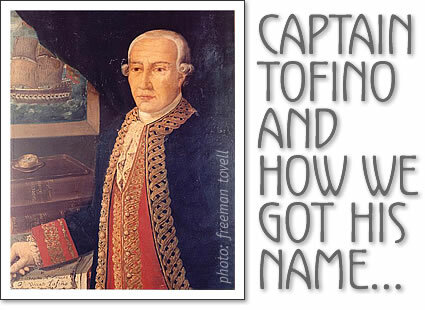 Like so many of the place names that are found on charts and maps, the namesake of the village of Tofino, Captain Vincente Tofiño de San Miguel, never saw the place where his name was immortalized. In the summer of 1792, commanders Dionisio Alcalá Galiano and Cayetano Valdés of the Spanish navy sailed along the west coast in their vessels Sutil and Mexicana. During their voyage through what is now called Clayoquot Sound they bestowed Tofiño’s name to an inlet they perceived to be unnamed. Of course the inlet and specific places along it, would have had several Tla-o-qui-aht names. As well, just the year before the inlet had been named “Gervete” by Galiano and Valdés’s Spanish compatriot Juan Pantoja, first pilot on the San Carlos. Incidentally, the names of these three Spanish navy men live on today in British Columbia—Galiano Island and Valdés Island in the Strait of Georgia, and Pantoja Island in the “Spanish Pilot Group” of islands southwest of Bligh Island in Nootka Sound. Vincente Tofiño was a rear-admiral in the Spanish navy. He was a renowned astronomer and mathematician and near the close of his career was the King’s hydrographer. Between 1783-1788, Tofiño charted the ports and coasts of Spain as well as the shore of North Africa. He eventually was elected as correspondent of the Spanish Academy of History and of the French and Portuguese Academies of Sciences. So how did the name of a nearby inlet become the name of our town? Initially, there was no village or settlement named Tofino. The first non-native settlement in the area was at Clayoquot on Clayoquot (or Stubbs) Island. In 1855, a trading post was established at Clayoquot by Banfield and Frances Ltd. Other stores owners followed and the settlement continued to grow, with houses, a school, a hotel, and even a jailhouse. There was also a settlement on Vargas Island and several settlers including John Grice and John Chesterman had preempted large tracts of land on the Esowista Peninsula. So in the early days of settlement, homesteaders were spread throughout the area and used Clayoquot as their centre for getting supplies and mail. In 1901, though, the store at Clayoquot had some competition when Sing Lee, a miner, opened a store on what is now called Grice Road, near the present-day First St. dock. Eventually the store was purchased by the partnership of Sloman & McKenna. Although there were now two stores in the region, Walter Dawley, the storekeeper at Clayoquot still maintained the post office, the pivotal draw for the residents of the region. Life was difficult for the settlers who were trying to farm and maintain homesteads throughout the Sound, and there was a move towards establishing a more centralized town. A townsite was surveyed on the end of the Esowista Peninsula and some of the first properties were sold to men whose names are still familiar in town today: Arnet, Eik, and Hansen. According to Ken Gibson, the town was originally referred to as Clayoquot townsite. But this was not enough to distinguish it from the village on Clayoquot island and confusion reigned. Dawley’s grip on the mail and goods monopoly had loosened over the years so items destined for the townsite often were delivered to the island or vice versa. Eventually, a new name was needed for Clayoquot townsite, and Tofino began to be used. A post office was opened in Tofino in February 1, 1909. For awhile Tofino was identified in the BC Gazetteer as a “Post Office and Steamer Landing,” but on February 5, 1932 it was incorporated as a village municipality. Adrienne Mason is a Tofino writer. If you have anything to add (or quibble about), please contact her at adrienne@postelsiapress.com Thanks to Ken Gibson for providing some of the information used in the article and the use of the above image of Captain Tofino. Tofino was named after Captain Vincente Tofino de San Miguel by Galiano and Valdes during their voyage of 1792. Tofino was named after Captain Vincente Tofino de San Miguel by the explorers Galiano and Valdes during their voyage of 1792.